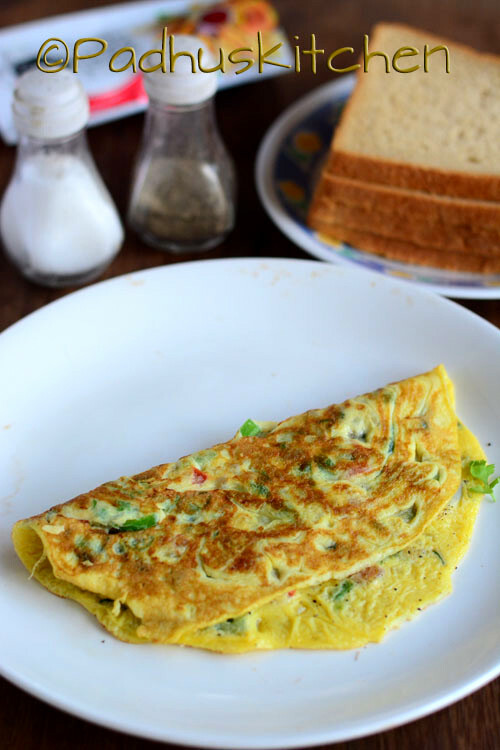 Vegetable Egg omelet can be enjoyed anytime of the day. Paired with bread, it makes a quick, delicous and protein rich breakfast. This vegetable omelette can be make in a few minutes. It is a great way to sneak veggies in your kids diet. Learn how to make this quick and easy veg omelet with these easy to follow steps. Finely chop all the vegetables. Beat eggs adding a tbsp of water, salt and pepper powder until frothy. Add all the vegetables to the egg mixture and beat for another 2-3 seconds. Grease a pan with oil and heat it. When the pan/tawa is hot, pour half of the the egg mixture and cook on low heat. Once the egg sets, flip it over to the other side. Let it cook for another few seconds on low heat. Remove from tawa, sprinkle pepper powder over the omelet and serve hot as such or with bread. Repeat the same process for the remaining mixture. You can have this omelet even as a side dish for rice. If you love eggs, then check out more Egg Recipes. If you found this post useful, I would really love it, if you pin it or share it with your Facebook fans or Twitter followers or Google+ circles today. All it takes is a simple click on the “pin it” “like,” “share,” “tweet,” or Google+ buttons below the post. Thank you! This looks like a great basic omelet recipe. I never got the hang of making an egg-only omelet and folding it over cooked ingredients. Having everything in with the eggs will work well for me. Thank you for dropping by my blog.Hope you enjoyed reading the recipes.Your feedback and comments are appreciated. Comments with links to external sites will be deleted. Padhu is an optimistic and a creative person Read more..
All the content in this website including text and pictures/photographs belongs to Padhuskitchen.com, unless otherwise mentioned. If you need to use it or reproduce it, you have to get my permission. Any unauthorized usage will constitute plagiarism. Padhuskitchen by Padhu is licensed under a Creative Commons Attribution-NonCommercial-NoDerivs 3.0 Unported License.